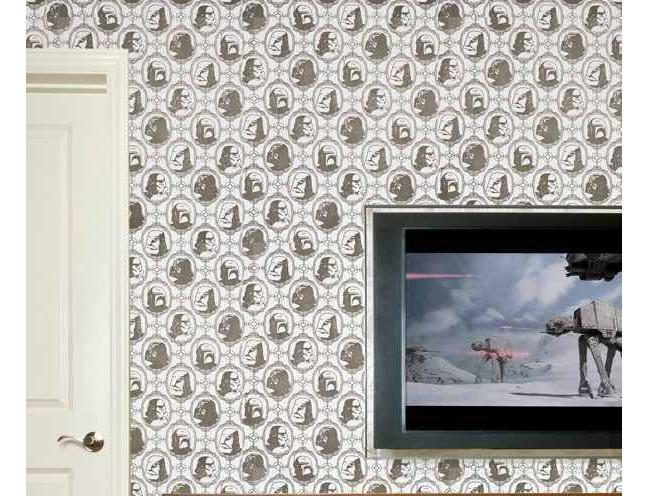 Seen below is a room covered with Imperial Wall Paper. If you looke closely enough there are portraits of Darth Vader, a stormtrooper, a snowtrooper, and Boba Fett. The four are printed in a repeated pattern, thus guaranteeing a very uniform look to whatever surface this wallpaper is applied to. But wait, is Boba Fett a soldier of the Empire? Sure, it was his dad’s DNA that was used to create the Republic’s clone army, but since he remained a bounty hunter that makes his political affiliations vague, doesn’t it? After some research, turns out Baba Fett never affiliated himself completely with the Empire but did do lots of business for them. The best example would be him tracking down Han Solo and eventually delivering the carbonite slab to Jabba. but wait, didn’t Jabba pay for that? His profession meant that he never really sided with anyone and on many occasions outside the movie canon Boba Fett carried out missions against the Empire. Actually, while Boba did work for the Empire on numerous occasions, his colorful bio also involves lots of other bounty hunter deeds that really set him apart from other pantheonic Star Wars characters. Important note: he survived being eaten by that giant sand creature from Episode III. Not gonna lie, it’s true. Since Boba’s reputation is too colorful, it would have been better if an officer of the Galactic Empire were printed in lieu of Boba Fett. It still looks good though.